Dark Dungeons tells the story of Elfstar, played by Debbie. In the opening panel the Dungeon Master, Ms. Frost, asks Debbie’s Wizard to cast a spell and she succeeds, but Marcie’s thief, Blackleaf, fails the detect traps roll and dies (without getting the a save vs poison roll). Marcie is devastated by this, and presumably Debbie telling her to leave and that she doesn’t exist anymore doesn’t help matters much. But, apparently Debbie’s act of ruthlessness toward Marcie shows Ms. Frost that Debbie has what it takes and she advances to 8th level, which seems to be the trigger to being initiated into the DM’s coven. Marcie eventually commits suicide, prompting Debbie to have a change of heart about the whole ‘cult’ thing. The suicide gets blamed on the in game death of Blackleaf, who had a 50/50 chance to find and remove traps (assuming she was 7th level). But the real blame is the DM’s for not letting Marcie roll to save vs poison (she would need a 12 or better) and on Debbie for telling her to leave and not letting her roll up a new character. Later, at church, Debbie’s pastor calls for them to bring in all of their occult paraphernalia like rock music, occult books and dark dungeons material to be burned. Earlier editions of this comic included Tolkien and C.S. 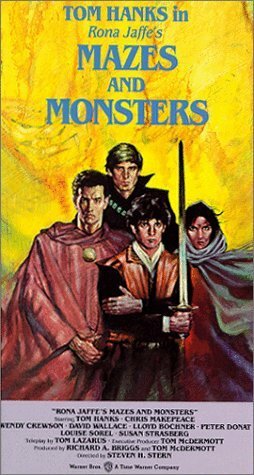 Lewis as well as called out Dungeons and Dragons by name. One can only imagine the cease and desist letters they got for that. Dark Dungeons is still in print by Chick Publications and can occasionally be found lying about with other issues of Chick Tracks. 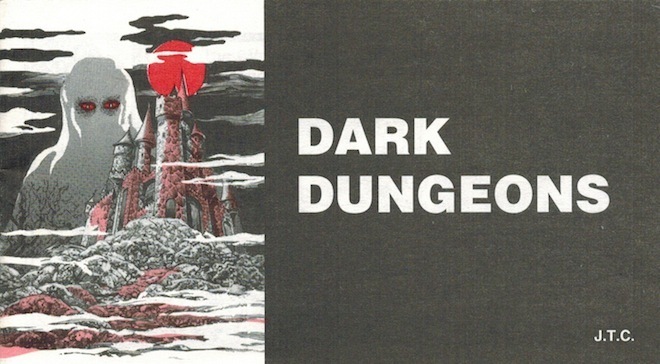 In 2010 Gratis Games began publishing the Dark Dungeons RPG, http://www.gratisgames.webspace.virginmedia.com/darkdungeons.html a “Retro Clone RPG” using open source material from the classic editions of your favorite RPGs, Dark Dungeons features repeated use of the characters from the original Chick Tract as examples, game play and character creation. This year Zombie Orpheus Entertainment will be releasing Dark Dungeons the Movie http://darkdungeonsthemovie.com at Gen Con in August of 2014. Amazingly, this Kickstarter funded film is approved by Chick Publications and is frighteningly true to the original source material with stretch goal bonus of an appearance by the Cthulhu Mythos and the Necronomicon. So the next time you and your fellow adventurers embark upon another epic quest for fortune and glory, remember that that trail was not always so easily traversed, and many brave souls perished to forge that path before you. Role playing games are still stigmatized in many parts of the country thanks to misinformation and misunderstanding of the hobby.